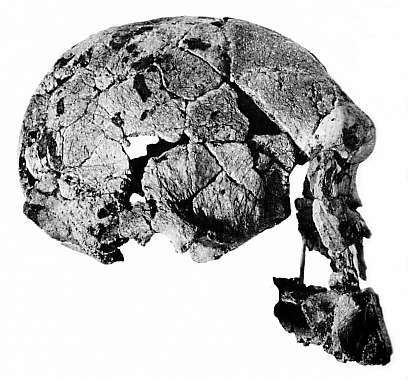 Although the above two skulls look quite similar, most creationists claim that the first one (ER 1470) is human, while the second (ER 1813) is classified as an ape by the few creationists who even mention it. It seems safe to say that because of its small brain size (510 cc), no creationist would want to classify ER 1813 as human. 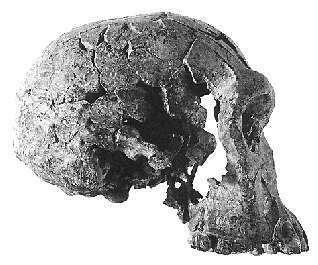 Note that in top view, 1470's skull narrows behind the eyes, like 1813 and some Homo erectus skulls. This is known as post-orbital constriction, and as a result the cheekbones, or zygomatic arches, are easily visible from above. In modern humans there is little or no such constriction, and the cheekbones are barely visible from above. Also, in front view, 1470 in this illustration looks much less human than do photos of the actual fossil. This is because 1470's cheek bones were broken off, although enough was left to show that they flare out to the side, as shown above. This illustration is from "The Human Career", an excellent textbook by Richard Klein.